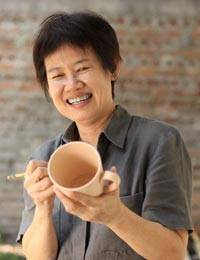 Taking her inspiration from Thailand's rich floral beauty, Duangkamol crafts a beautiful vase. Autumn leaves drift on a cool blue background where blossoms linger. The leaves appear in the natural color of the clay in a superb example of the celadon ceramic art. 10 cm H x 11 cm Diam.